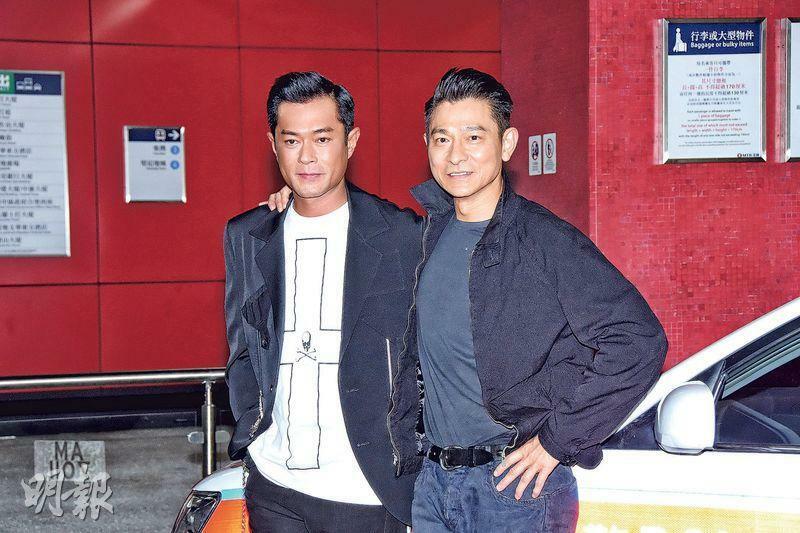 The Andy Lau Tak Wa produced and starred, Herman Yau Lai To directed, Louis Koo Tin Lok, Michael Miu Kiu Wai, Chrissie Chau Sau Na, Cherrie In Choi Yi starred film THE WHITE STORM 2 DRUG LORDS (SO DUK 2 TIN DEI DUI KUET) yesterday held an unveiling ceremony. 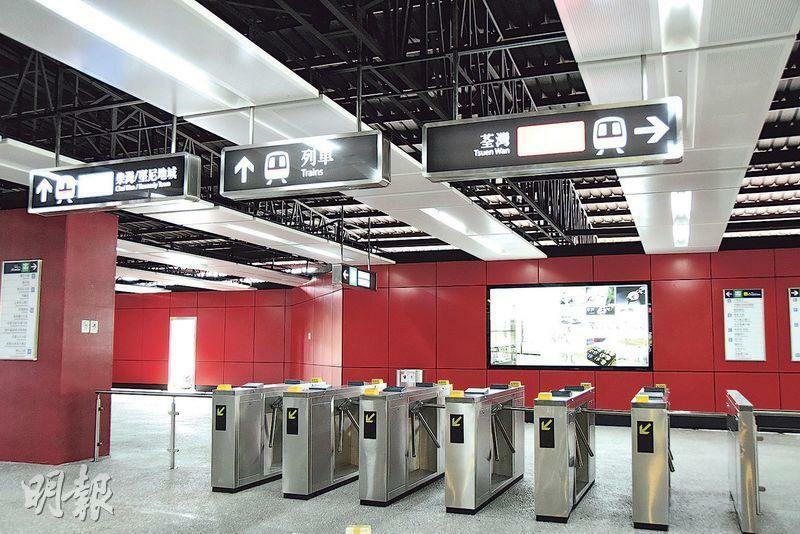 The film production would cost around HK$ 220 million, as the company spent over five months and over HK$ 10 million on the construction of a full scale MTR station next to the Kai Tak Cruise Terminal. Wa Jai and Goo Jai have not ridden the MTR in a very long time. Sam Gor even jokingly suggested for Wa Jai to take his daughter to take the MTR. Wa Jai immediately played mad and called Sam Gor a troublemaker. However Wa Jai praised Sam Gor for being the best "chok" among the three of them. Sam Gor instead called Wa Jai the "first chok". Goo Jai also held his own. 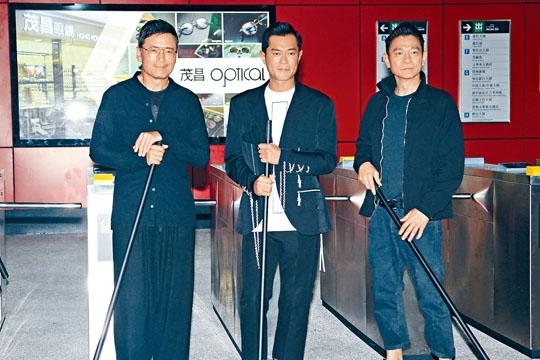 At the event, the film company arranged for "drug lords" Wa Jai and Goo Jai to arrived in a police vehicle, then began a drug sweep operation with brooms with other actors as they swept away the drugs on the floor. In the film they played villains and brothers, Sam Gor was a drug sweep team cop who wanted to arrest them. In one scene they ran into each other on the MTR. Although they worked in the heat, Goo Jai who had the flu said that he was used to shooting winter scenes in the summer and summers scenes in the winter. Speaking of their costumes, Goo Jai said, "I would grow my hair long and a beard, as well as a handicap. The details will have to be kept under wraps, but in he film I would have many girlfriends -- the most in history. I would have intimate scenes with each girl, but no bed scene." Wa Jai revealed that he would start with a pony tail and spend four hours on hair extensions. When he got home his father thought he was working a costume film. He was used to costume period roles, but he was not used to playing a modern role with period costumes. When asked how long has it been since their last MTR ride, Goo Jai admitted, "I haven't been to a MTR station in 10 or 20 years, not even for a movie because MTR stations were hard to get for movie shoos. Otherwise we wouldn't have to build a MTR set. (Would you put on a mask to experience the MTR?) I would dare to, I just don't know how to take a transfer. Instead I would take the subway overseas, as I would be able to take my time and get the feel of it. It would be more convenient than other transportation methods. In some places I waited for half a hour for the light to change." Wa Jai said, "I haven't taken it for at least 15 years, but after SARS taking it with a mask would be a little better. Sometimes if I would be in a hurry to get across the harbor I would take it to Central. I would want to find an opportunity to take it again." Sam Gor happened to pass by and joked, "Ask him if he would take his daughter to walk around at the MTR." Wa Jai played mad and called him a troublemaker. Sam Gor joked, "What does it matter, you would be wearing a mask anyway. (Would you take Wa Jai's daughter to take the MTR?) I think he would chop me to death, since he wouldn't let go of his daughter's hand." Speaking of stars being named after Lau Tak Wa, Koo Tin Lok, Leslie Cheung Kwok Wing and Anita Mui Yim Fong, Wa Jai said, "I only found out from the news, there are more stars in the sky than people, everyone can get a star named after them." Goo Jai said that at first he did not know how to respond because he never thought about naming something after himself. Of course he would feel honored as it was very special. A star in the galaxy was his, which would be a great commemoration. Speaking of three hunks gathering together, Wa Ja joked, "When we get together, Sam Gor is the most chok." Sam Gor disagreed, "How can I be more choke than these two, Wa Jai is the first chok, Goo Jai holds his own as well." Sam Gor revealed that he very much looked forward to the MTR sweep and the car chase scenes, in them would be real and fake MTR stations. Sam Gor would normally take the MTR and without a mask. He said, "It doesn't matter if people ask for pictures, they would only ask because they respect you." Chau Sau Na said that she would take the MTR with a mask and even slept past her station once. "Even when it reached the station I was still asleep. Later when I heard the announcement I finally got off." In the film she would play Wa Jai's former girlfriend and would have a teenage son. She admitted that she was very surprised to see a son who was as tall as her, but for a movie it was fine. Ying Choi Yi was supposedly the matchmaker for Stephy Tang Lai Yun and Prince Chiu. Did Ding Ding already have her matchmaker tea? She said, "No, I only took the singles to dinner. I am not a Mamasan, and they knew each other when they were with the same company. (Was it your intention to play matchmaker?) No, I just asked everyone to dinner. Whatever happened between them had nothing to do with me." Ding Ding yesterday promoted the film. She revealed, "In the film I would play the Big Sister, one of the four great drug lords. However I wouldn't have any relationship scene with Goo Jai and Wa Jai. We would only talk business. In the film the husband is already dead." Ding Ding already finished her part. Today she would go to the Mainland with husband Jordan Chan Siu Chan and their son Jasper for a reality show shoot. Ding Ding would provide transportation and wait for them at the hotel. She said, "This shoot would be my son's summer class, children really like to play with everyone. The process is tough but he has learned a lot." She joked that her son was there to suffer and not to play.